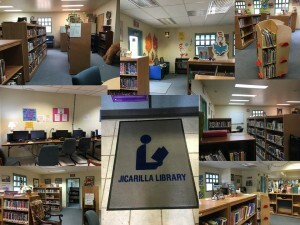 Last week the Tribal Libraries Coordinator, Alana McGrattan and I headed up to the Jicarilla Public Library in Dulce for some consulting and wanted to check out the Eleanor Daggett Memorial Library in Chama while we were in the neighborhood. First off, the drive up there was SPECTACULAR! There was a slight threat of snow which we could see in the distance but luckily didn’t experience. 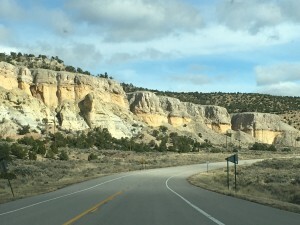 If you ever get a chance to head north up Highway 84, I definitely recommend it! I wasn’t driving while photographing! The Jicarilla Public Library is a gem tucked away in the hills of Dulce! They have a very nice collection for a wide range of interests with lots of comfy seating (if we had had time I would’ve picked out a book or two I saw on their shelves I’ve been wanting to read and curled up on one of those chairs!). The children’s section is bright and colorful with craft supplies available to anyone at any time of the day! The staff at Jicarilla has created a welcoming place that encourages patrons to stay awhile. 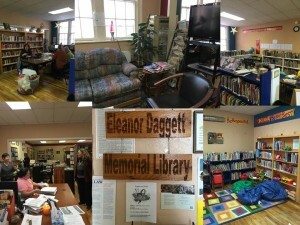 After Jicarilla we headed to Chama to visit the Eleanor Daggett Memorial Library. The director, Melissa Polaco, welcomed us and shared some of the new things she and her staff have been offering their patrons. Their newest program is offering beginning and intermediate quilting classes (they even quilted covers for the library sewing machines!). This summer the library will offer sewing classes to kids 12 and up. She also showed off the space she has outside for a garden that the kids plant and take care of after storytimes! 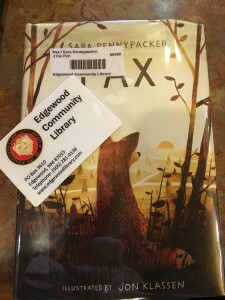 Later in the week, I took a trip to Edgewood to visit the Edgewood Community Library. First off, that library has AMAZING views and it’s so bright and cheerful! While I was chatting with Andrea, the director, I noticed a book that was being processed and had a minor fan-girl moment since it’s a book I’ve been DYING to read and have had on hold at my library for months. So what did they do? They issued me a library card and let me check it out! Great service right there! Their collections were really extensive with great displays and the programming they’re doing are really impressive. We talked about Summer Reading and the people they’ve lined up to talk to the kids sound like a lot of fun: a local football coach, a yoga instructor and nutritionist just to name a few! They rely on their community which is a great resource! It was great getting out of the office for a bit and visiting some really great libraries! I’m marking off all the libraries I get to visit and look forward to checking off more as time goes on!